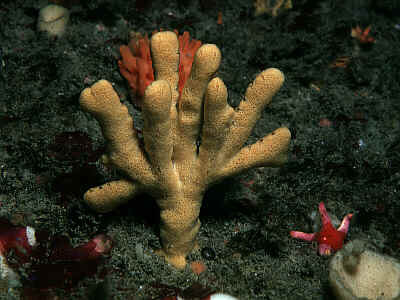 Description: This is one of the most conspicuous branching-erect sponges that occurs in the British Isles. It is yellow, pale orange or buff in colour and consists of thick branches approximately 1.5cm in diameter, arising from a thicker base. 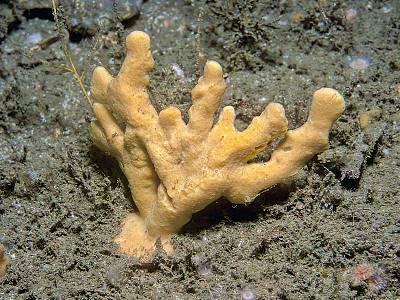 The surface of the sponge has a velvety appearance. 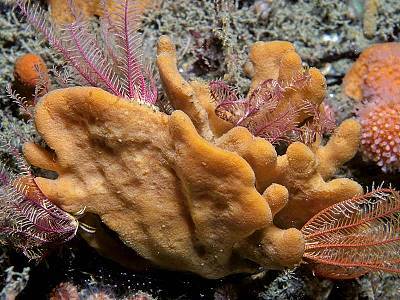 The colony is typically the size of an adult's hand. The oscules are small and regularly spaced along the sides of the branches. They are placed in depressions and are often opposite, this can cause slight annulations on the branches. They have a number of short, shallow, surface grooves. These stellate grooves become more conspicuous when the specimen is out of water. 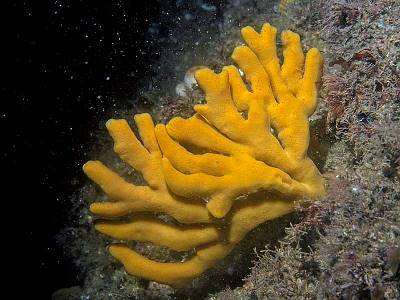 Habitat: This sponge is usually found on upward facing, circalittoral bedrock on exposed open coasts, however in the Channel Islands, Brittany and Lough Hyne, Co Cork it also occurs infralittoral bedrock. 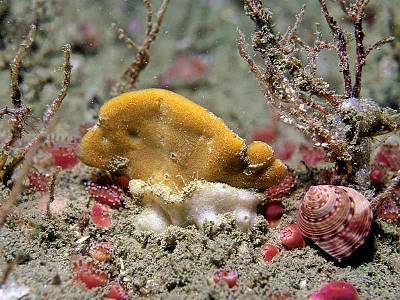 Distribution: This is a south-western species in the British Isles, occuring as far north as Anglesey and on the Atlantic coast of Ireland as far north as Rathlin Island, Co Antrim, there is one recent record from the west coast of Scotland. 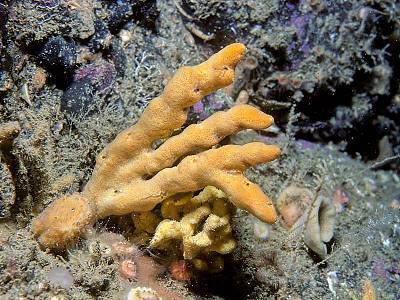 Similar Species: This species may be confused with other branching-erect yellow sponges e.g. Stelligera stuposa and Raspailia hispida but can be distinguished from them by the relatively thicker branches and the presence of stellate grooves surrounding the oscules. Relatively thick branches (approximately 1.5cm). Stellate oscular grooves arranged along the sides of the branches. Picton, B.E. & Morrow, C.C. (2016). Axinella dissimilis (Bowerbank, 1866). [In] Encyclopedia of Marine Life of Britain and Ireland.